Heather Peters sued Honda after her car didn't achieve ... Heather Peters sued Honda after her car didn't achieve the MPG she expected (AP). A judge has overturned a ruling that allowed a California woman to collect nearly $10,000 from Honda in small-claims court because her vehicle received lower-than-advertised fuel economy. Heather Peters sued American Honda Motor Co. after achieving far less than the 50 miles per gallon she expected from her 2006 Honda Civic Hybrid, and improbably won a $9,867.19 judgment against the company in February. Although he said Honda's advertising slogans amounted to "sales puffery," Judge Dudley W. Gray II said in his Tuesday reversal that they did not make specific MPG promises. His ruling noted that the majority of Civic Hybrid drivers came close to meeting the mileage estimate provided by the U.S. Environmental Protection Agency. The decision, handed down in California Superior Court, is final. The state's laws do not allow for further appeals. "It's a sad day when regulations designed to protect consumers are used against them," Peters said in a written statement. "I'm certain that the EPA and FTC never intended to shield Honda from liability for advertising claims that a court of law determined to be false." The window sticker for the '06 Civic hybrid cites EPA mileage estimates of 49 miles per gallon in the city and 51 MPG on the highway. Peters said, at best, she got 37 MPG from her vehicle, and that fuel economy further deteriorated after Honda provided a software update for the car's battery. In court testimony during the appeal, a technician said he achieved an MPG average close to 50 in an '06 Civic Hybrid. But Peters' actual vehicle was not tested during the litigation. In a written statement, Honda said it was pleased with the ruling, "which affirms that Honda was truthful in its advertising of the fuel economy potential of the 2006 Honda Civic Hybrid." The lawsuit had attracted considerable attention within the auto industry, not only because automakers have trumpeted their fuel economy ratings in attempts to attract shoppers concerned about rising gas prices, but because Peters had opted out of a class-action lawsuit over the same issues with Civic Hybrids built between 2003 and 2009. When she initially won in February, her victory emboldened others dissatisfied with the $100 to $200 proposed settlement, which also came with a rebate off future purchases. According to court records, 1,705 people opted out of the settlement, which gave them the leeway to, like Peters, pursue an individual case. In reality, few have followed her path. Only 18 have brought small-claims court lawsuits, and Honda has prevailed in 17 of the verdicts, according to spokesperson Chris Martin. The class-action lawsuit, Lockabey v. American Honda Motor Co., was settled in March. "We are never satisfied when a customer is anything less than satisfied with one of our products, and the company does not relish the necessity to defend the truth in opposition to any of our customers," Martin said in a statement. Although the victories have been good for Honda, there have been other disconcerting numbers. Last year, sales of the Civic Hybrid fell 37.1 percent from 2010, dropping from 7,336 to 4,703, according to sales figures from Autodata Corp. So far this year, those numbers may recover. 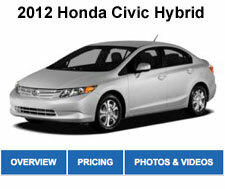 The Civic Hybrid had sold 2,862 units through April, which puts it on pace for 8,586 annually in 2012. But the Civic Hybrid lags behind competitors like the Toyota Prius and Hyundai Sonata Hybrid, which have already sold 86,027 and 15,143 units through the first third of the year. "Of course I'm disappointed," Peters said in her statement. "But I'm still glad that I raised awareness that Honda is no longer the great brand that it used to be. They used to go the extra mile in customer service. Now they go the extra mile fighting customers in court."